In the mid-1980s, Microsoft and IBM cooperated to develop the OS/2 operating system, which was written in assembly language for single-processor Intel 80286 systems. In 1988, Microsoft decided to make a fresh start and to develop a "new technology" (or NT) portable operating system that supported both the OS/2 and POSIX application-programming interfaces (APIs). Windows NT version 4.0 adopted the Windows 95 user interface and incorporated Internet web-server and web-browser software. In addition, user-interface routines and all graphics code were moved into the kernel to improve performance, with the side effect of decreased system reliability. Although previous versions of NT had been ported to other microprocessor architectures, the Windows 2000 version, released in February 2000, discontinued support for other than Intel (and compatible) processors due to marketplace factors. Windows 2000 incorporated significant changes over Windows NT. It added Active Directory (an X.500-based directory service), better networking and laptop support, support for plug-and-play devices, a distributed file system, and support for more processors and more memory. In October 2001, Windows XP was released as both an update to the Windows 2000 desktop operating system and a replacement for Windows 95/98. In 2002, the server versions of Windows XP became available (called Windows .Net Server). Windows XP updates the graphical user interface (GUI) with a visual design that takes advantage of more recent hardware advances and many new ease-of-use features. Numerous features have been added to automatically repair problems in applications and the operating system itself. 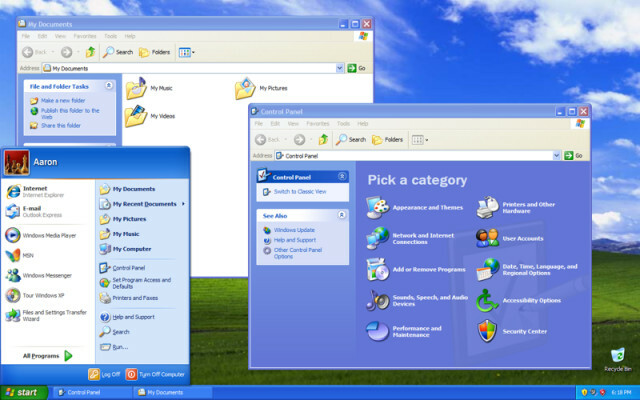 Windows XP provides better networking and device experience (including zero-configuration wireless, instant messaging, streaming media, and digital photography/video), dramatic performance improvements both for the desktop and large multiprocessors, and better reliability and security than even Windows 2000. Windows XP uses a client-server architecture (like Mach) to implement multiple operating-system personalities, such as Win32 API and POSIX, with user-level processes called subsystems. The subsystem architecture allows enhancements to be made to one operating-system personality without affecting the application compatibility of any others. Windows XP is a multiuser operating system, supporting simultaneous access through distributed services or through multiple instances of the graphical user interface via the Windows terminal server. The server versions of Windows XP support simultaneous terminal server sessions from Windows desktop systems. The desktop versions of terminal server multiplex the keyboard, mouse, and monitor between virtual terminal sessions for each logged-on user. This feature, called fast user switching, allows users to preempt each other at the console of a PC without having to log off and onto the system. Windows XP is the first version of Windows to ship a 64-bit version. The native NT file system (NTPS) and many of the Win32 APIs have always used 64- bit integers where appropriate—so the major extension to 64-bit in Windows XP is support for large addresses. There are two desktop versions of Windows XP. Windows XP Professional is the premium desktop system for power users at work and at home. For home users migrating from Windows 95/98, Window's XP Personal provides the reliability and ease of use of Windows XP, but lacks the more advanced features needed to work seamlessly with Active Directory or rim POSIX applications. The members of the Windows .Net Server family use the same core components as the desktop versions but add a range of features needed for 22.2 Design Principles 785 uses such as webserver farms, print/file servers, clustered systems, and, large datacenter machines. The large datacenter machines can have up to 64 GB of memory and 32 processors on IA32 systems and 128 GB and 64 processors on IA64 systems.